combined with a map of hot and cold spots in the background. The satellite also pegs the age of the universe at 13.7 billion years. http://www.sciencenews.org/articles/20030215/fob1.asp). The new results focus on the polarization of the microwave-background radiation, the tendency of the radiation's waves to vibrate in a specific direction. The polarization signal reveals that the first stars formed 300 to 400 million years after the Big Bang. That's slightly later than estimates that were based on earlier data from the same satellite, notes cosmologist Michael Turner of the University of Chicago. Accounting for the polarization was like "removing a fog," says Spergel. 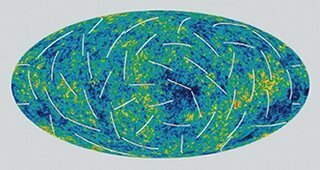 It enabled the team to scrutinize more closely than ever before the primordial fluctuations imprinted on the microwave background. According to the simplest model of inflation, the universe didn't balloon at a constant rate during the early growth spurt. light-years. The satellite has now found exactly that pattern, the team reports. "This is not simply another test of inflation but something that examines the universe during its first trillionth of a trillionth of a second," says Turner. "The entire cosmology community has been waiting for this, excited and worried." The findings "are beginning to shed light on the mechanism [that drove] inflation," he adds.